I am reading (actually, listening to) Michael Pollan’s new book, Cooked. Am I enjoying it? Well, yes and no. “Yes,” to the expanding of my foodview (I think this is a new word I’ve invented but not yet patented…so use it without charge) but “no” to my vegan commitment. Halfway through the book I have learned so much about what it means to actually cook my own food. We do a lot of cooking around my house. My wife is a gourmet-quality cook. She loves to make tried and true recipes and to try new recipes. Alas, she is in poor health and I have taken over a lot of culinary responsibilities. So, I was very interested in what one of my favorite authors had to say about the subject. As with all Mr. Pollan’s books, I am enlightened, inspired and encouraged to keep the culinary faith. I became a vegan after doing a lot of research about what clogs up the circulatory system of Americans. (You may know that heart attacks are the leading cause of death for those who eat the American way.) I found that I have a lot of plaque in my veins and arteries and decided to look into ways to reverse the condition. That led me to begin eating a no-fat (or very low fat) plant-based diet. It is satisfying, inexpensive and delicious. But, you see, I am a convert to this way of eating from the vein and artery-clogging omnivorous way I have eaten for decades. That means that my mouth still waters at visions of various forms of meat. I am eating the no-fat plant-based way for health reasons only. If you fall into my category, it means you retain strong memories of succulent sausages, bacon, steaks, barbeque ribs, lamb chops, roasts, etc. After listening to the first part of Mr. Pollan’s book, I wanted nothing more than to find a whole-hog barbecue joint and chow-down. I wanted to find me some good Texas brisket or cabrito and, fat dripping from my chin, enter into a kind of carnivore nirvana. Be warned: Michael, a committed omnivore, will make you think twice about, well…sinning. I am happy to report that I have righteously remained vegan…so far. One day at a time. We all have to die of something but I would like to be as healthy as possible and then, when my time comes peacefully, painlessly drop dead. At my age, departure is not too far off and I could say I prefer to leave this life with fried chicken in stomach. 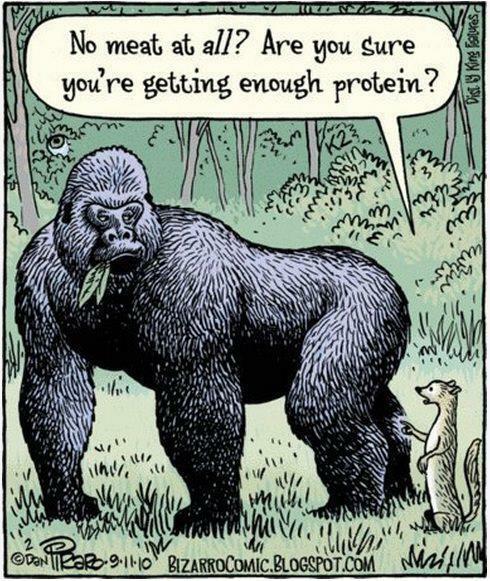 But, since I am already noticing some benefits of veganism, I think I will continue with the oats, peas, beans and barley…etc. My garden will help. In spite of the funky weather and bad knees, I am steadily getting things planted. I look forward to harvesting baskets of summer fruit. We hope you enjoyed this Bizarro comic! You can share it on Facebook by clicking on the image. You can learn more about Bizarro comics by visiting the Bizarro Comic website. As readers of this blog will remember, someone stacked a pile of junk lumber in front of my shop. In case you missed it, you can see it here. All of it is destined for the fireplace or, in the case of the plywood, fiberboard, chipboard etc., the garbage. That is, all of it except one board, which knew a former life as a frame for a waterbed. It was pretty thick, crack-less and with only two knots. So, I decided to do something with it. 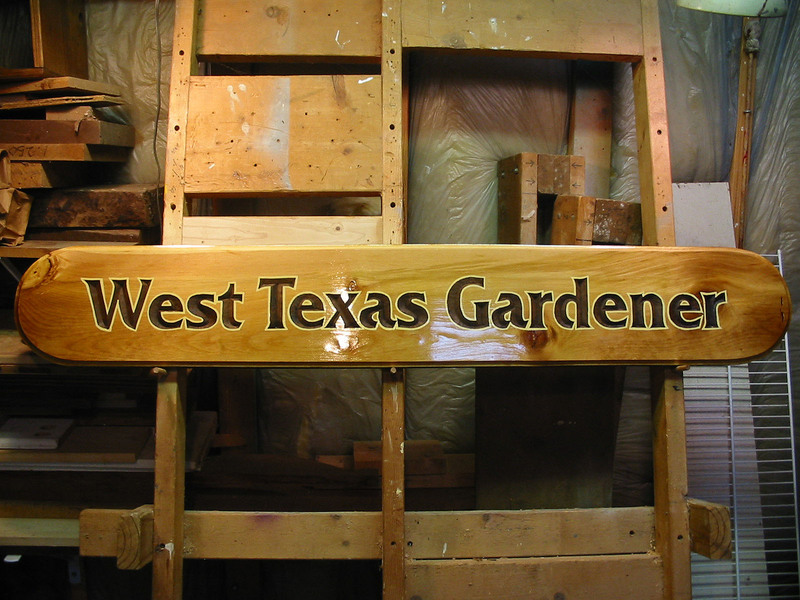 I wanted a unique header for my refurbished gardening blog: “West Texas Gardener” and, since I am a woodcarver, I decided a hand-carved sign might be nice. So, I set to work cutting the blank, sanding, routing, applying polyurethane, masking, applying the pattern, carving, staining the incised letters and, finally, outlining the letters to make them stand out. As I carved, I remembered why I hate carving regular pine (as opposed to sugarpine which carves quite nicely). It is an unpredictable wood, often brittle, and will sometimes “shred” under the sharpest of tools. The knots are almost impossible to carve without them crumbling like a cookie. But, I eventually finished the process, photographed it for my garden site, and I hope you like the result. Scene: Produce section of our local grocery store in their tiny “organic” section. 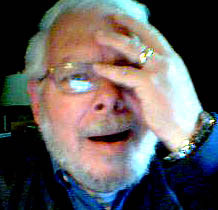 A middle-aged man and woman are having a conversation my wife overhears. When Brenda related this conversation to me I laughed at first. Then I thought, “They don’t know what ‘organic’ means? At their age? Do they live in a cave somewhere?” If this kind of ignorance exists in our media-saturated age, then I’m afraid the organic food movement has a long way to go. Here’s the dirt on “soil.” It may be fumigated with fungicides and “fertilized” with chemicals made from petroleum. That strawberry you are about to put on your cereal may have been grown in “soil,” but it may also be genetically altered and sprayed with potentially carcinogenic pesticides and herbicides. That tomato you are about to slice may have been grown in “soil” but what was done to the soil it grew in? What was done to it while it was growing? How was it handled after it was harvested? Until you know, do you really want to put that in your mouth? My carrot patch (the picture above is of carrots I harvested today just in time for Valentine’s Day!) started out pristine – weeds were not allowed. After the seeds came up I faithfully pulled each weed and laid mulch between each row of carrots. It was beautiful. Then, I got busy elsewhere and the weeds took advantage of my distraction. Now, the carrots are finally ready to be pulled but it’s hard to tell the carrots from the weeds. But, know what? It’s not a problem. When we need carrots, I just go out and pull both weeds and carrots. It’s easy to tell the difference – the carrots have those long, orange roots (you know, the part we eat) while the weeds don’t. So, I quickly sort the carrots from the weeds and take the former into the house to prepare for a meal. While this method won’t work for most vegetables, this is how I would love to garden…just let the weeds grow! Then, when it comes time to harvest, sort it all out. In the garden of the world that’s exactly what God does. He asks us to sow the seed (word of God – the gospel), plant and water (1 Corinthians 3:4-9). The resulting growth is His work, not ours. In every case, some weeds will come up. Thankfully, it’s also not our job to discern the weeds from the wheat, that’s God’s business. At harvest, He takes care of the sorting. When we try to do God’s work and pull up the weeds, precious souls are damaged. We’re terrible at it. Yet, that’s exactly what we spend a lot of time and energy doing…deciding who’s in and who’s out. The results are predictable: disunity, denominational polarization and isolation, anger and disgust by those who observe. Men and women are drawn by the cross but repelled by our actions. Satan loves it. Let’s leave the weeding up to God.